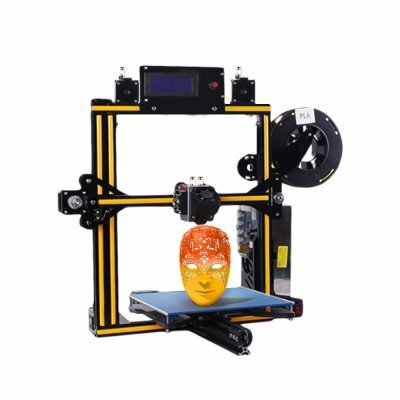 Successfully Added Zonestar Z5M2 DIY 3D Printer Kit – Dual Extruders, Large Printing Size, Multi Color Printing, SD Card Printing, LCD Display to your Shopping Cart. With this easy to assemble DIY 3D printer kit from Zonestar, you’ll be able to easily print any object your mind can imagine. This cheap 3D printer offers an affordable way for small businesses and hobbyists to enter the world of 3D printing. Whether you use it for making toys, jewelry, of everyday household items – this 3D printer is sure to meet your demands. The printer itself comes with a large LCD display for easy usage and is compatible with iOS, Windows, and Linux operating systems. With its SD card printing support, you’ll be able to print your designs straight from a memory card even when you’re not connected to the internet. This DIY 3D printer kit features dual nozzles thanks to which I supports multi-color printing. With its large printing volume of 220x220x220mm, this beauty won’t limit you to making smaller sized objects only. The 3D printer comes with a stable aluminum frame and features auto leveling. This means that you’ll always be treated to highly accurate and precise print results no matter the project you’re working on. With its wide range of filament support, this 3D printer kit meets the likings of anybody out there. The 3D printer comes with a 12 months warranty, brought to you by the leader in electronic devices as well as wholesale electronic gadgets..